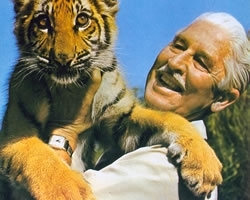 Born as Richard Marlin Perkins in 1905 in Missouri, USA he would later become famous as the host of ‘Mutual of Omaha’s Wild Kingdom’, bringing his passion and love for wildlife to millions, but his beginnings were at the bottom. Perkins interest and fascination with animals, like many wildlife professionals, started at a young age. At the age of 7 he started his own home zoo by collecting various animals like snakes, toads, even mice and worms. He enrolled in Zoology in university but quit school to become a labourer at the St. Louis Zoo, and it was here that his brilliant zoological career began. Perkins would later become the reptile curator in 1928 and continue to rise through the ranks. Then he was off to be curator of the Buffalo Zoo in New York and eventually was promoted to director in 1938. From 1944 to 1962 he was the director of the Lincoln Park Zoo in Chicago, Illinois and made a full circle back to the St. Louis Zoo this time as director. Marlin Perkins television career began at the Lincoln Park Zoo with a show called ‘Zoo Parade’ with the stars being the animals from the Lincoln Park Zoo. ‘Zoo Parade’ utilized animal behaviour for live theatrics as Perkins spoke of the animal’s habitat, behaviour and history. 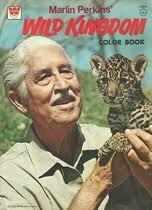 His big break came when he was offered the job of hosting ‘Mutual of Omaha’s Wild Kingdom’ in 1963. ‘Mutual of Omaha’s Wild Kingdom’ was a series about wild animals in the wild and in zoos and covered a diversity of subjects from the treatment of animals in zoos to the relationship between native people and the wild animals they share land with, as well as specific animals. This opportunity allowed Perkins to become an advocate for the protection of endangered species and through the television show many Americans had their first exposure to the conservation movement. The series showed viewers places few of them had ever seen and warned them that extinction is forever. The series ran from 1963 to 1985 and it was during this time that Perkins helped to establish the Wild Canid Survival and Research Center near St. Louis in 1971. The center dealt in international breeding of wolves for the eventual re-placement of them back into their natural habitats. Marlin Perkins sadly passed away in 1986 but only after leaving a lasting mark on many people by bringing animals and their plight into the forefront and open up their eyes to conservation, and this makes him a Wildlife Ambassador.